Most writers I've met in person are completely supportive of other writers no matter where they are in their careers. That's what this group, IWSG, is all about. For today's A to Z challenge, I have some encouragement for you all. Be Epic in your plans for you career and your life. Don't settle for Eventually or almost. Make a big plan how what you'll accomplish and how far you'll go. When you reach one goal, set the next one. Be Elastic in the path you ink in for your journey. Better use a pencil. When one direction hits a road block, find another route. There are so many paths to success available these days and more will open as the world of publishing advances. Know a writer you like or who has found a way to success. Emulate those you admire and see if their style fits your intended pathway. But don't forget to find your own Epic career. If you haven't visited already, check out IWSG Facebook page. Do you have epic plans? Are you elastic? Anyone you emulate? Susan Gourley writes epic fantasy and also write romance as Susan Kelley. 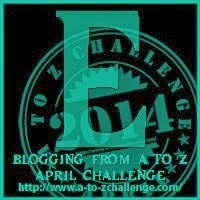 Read her world building posts for A to Z at Susan Says. Hi Susan .. what a lovely "E" post - getting on with things is something we really all should be doing ..
What a great post. I love coming and seeing you A to Z post they always leave me feeling inspired. Thanks Hilary and Joss. Having you visit during A to Z is EXTRA special. A really encouraging post! What a great idea for an A to Z post. Epic, Elastic, Emulate and not settling for Eventually. Perfect! Great post, Susan. Epic plans? Yup, to get more books published this year. Anyone I emulate? Lynn Grabhorn's one of 'em. J.K. Rowling and Suzanne Collins, too. I'd sure like to emulate the way Preston and Child write. Being flexible is a must and it's always good to emulate those who've gone before and done well, particularly if they write in the same genre. I need to be more flexible ... maybe if I wore looser pants. What a great pep talk to start the day! Thanks so much. I really love what you do for our group here! I think I've not been elastic enough in the past and need to change that. Yeah I got it now, I didn't think of what would be before and after I publish my book. Serves me right - yet all is not lost. Thanks to all the resources I am picking up here, I am gradually becoming more secure! I think "Be Epic" is like my new favorite saying! Love this, Susan. I've been struggling with setting for eventually lately. Thanks for the inspiration to stop that! Hi, stopping by #a2zchallenge. What an inspiring POST EPIC! I love your guidance and generous advice... Off to be EPIC and Elastic !!!! I absolutely have epic plans ;) Though perhaps not everyone's definition of epic. I have plans for epic joy. :D Elastic is more difficult, but I'm working on it. Right now I am trying hard at accepting and emulating me. "Don't settle for Eventually" - words to live by, especially when you have a tendency to procrastinate like I do. I'm learning to be more "elastic" in my writing career. There's a difference between being focused and living with blinders on. I'm Energized by your post, Susan. Energized in Epic proportions, which is why I'm wearing Elastic waisted pants because I'm off to Emulate Alex Sokoloff and write an intensely suspense filled scene. Couldn't think of a word for suspense that starts with an E.
Oh! Exciting scene! Edgy. Extreme! Extraordinary! Great post. i an entirely enthusiastic.